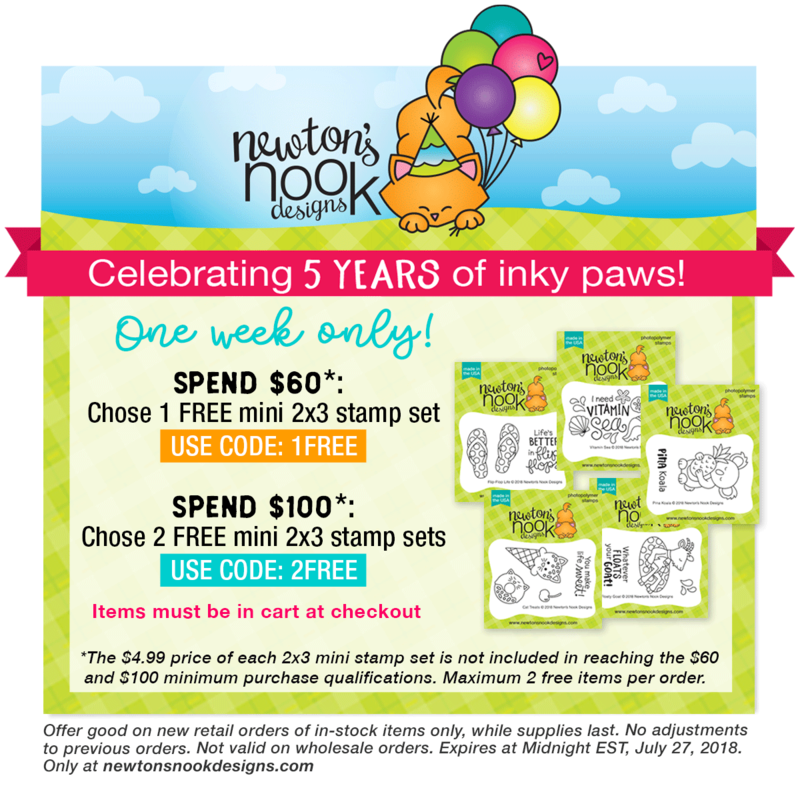 I’m so excited to be part of the Newton’s Nook Designs 5 Year Celebration blog hop! You might come here from the talented Maria Russell! 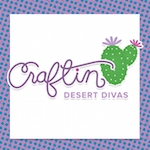 During this week the Design Team was showcasing all the FABULOUS new products from the extra special July release filled with new stamps, new dies and stencils! Have you already picked your favorite?! Giveaway alert!! NND is giving $25 store credits to spend in their online shop to 5 lucky winners so make sure you read all the way to the bottom of this post to see how to win! If you’re still in doubt, I have another inspiration project for you featuring new small, but not less adorable Flip-Flop Life stamp set. Working on this card, I started with stamping a pattern on a piece of Neenah Solar White paper with Memento black ink since it’s copic friendly. Next I proceed with a simple coloring and added non directional shade around every flip-flop with a light gray color. Here’s the complete list of all the colors I used here: BG10; Y00-Y11; YG00-YG01-YG05; RV10-RV02-RV04; T1. Once adhered my colored pattern to the light blue card base, I die cut using the coordinating Flip-Flop Die Set another pair of cute flip-flops that were stamped and colored with a bit brighter shades along with a stamp edge frame from Framework Die used for the sentiment that comes from the same Flip-Flop Life stamp set. A coat of clear glitter pen and Glossy Accents added a finish touch to this card. 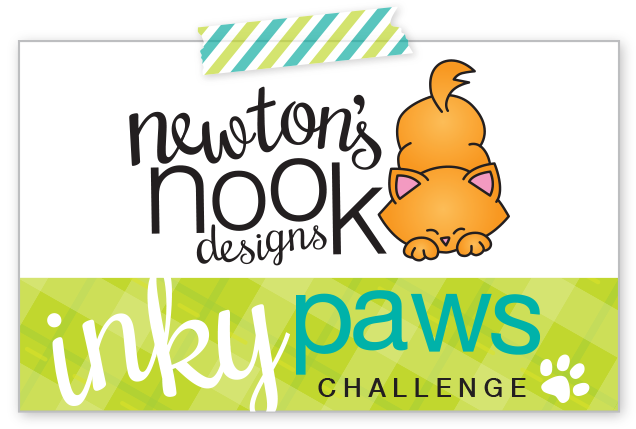 To celebrate 5 years, Newton’s Nook Designs is giving away a $25 store credit to spend in their online shop to 5 lucky winners! Comment on the NND Design Team and Special Guest blogs (see list below)! The winner will be chosen at random from the collective blog hop posts. Make sure to check out each of their blogs and comment for your chance to win. You will not know which blog has been chosen so the more you comment on the better your chances are of winning! You have until Sunday, July 22 at 9pm EST to comment. Winners will be announced on NND blog post on Monday, July 23 and will need to contact us to claim their prize so make sure you check back to see if you’ve won! Thank sooooo much for stopping by and hopping along with us! Have a great week-end!!! LOVE your flip flops… the colors are so pretty! love your clean and pretty card!!! I love your flip flop card! So cute! I think I might have to have this stamp 🙂 Thanks for sharing. Adorable flip flops card! Looks so fun to color! Fun card! The colorful flip flops look terrific. I so like what you have done with the Flip Flops – producing all that lovely art layout with your skills and it turned out beautifully, Tatiana – it has been a wonderful crafting inspiring journey this hop and I am happy to have had the opportunity to stop here and see your amazing work! TFS have a blessed day! 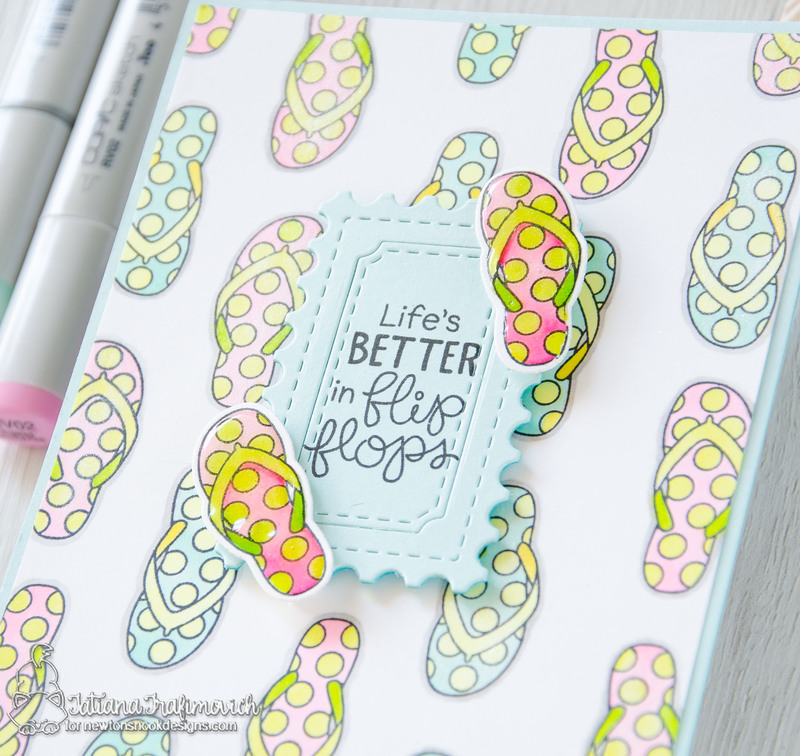 This flip flop card is so fun and perfect for summer! I love how you created a background with all the flip flops and added the sentiment in the center with two more! The colors you used are fabulous too! Thank you so much for helping us celebrate 5 years with our hop today! Love the cute pastel shaded flip flops on this card & the way it looks like they are popping off the page! Terrific job! Love your flipflop card!! those mini stamps are so wonderfull! Awesome card! 🙂 Love the colors you used. I have a weakness for flip flops and this card has stolen my heart! Perfectly sweet and fabulous. Wonderful and fun card, seems like you should be on the beach. wow~Wow~WOW!!! I just LOVE your light, airy coloring and who would’ve thought these cute casual flip-flops could look this lovely!? I love how you used this tiny image for your background AND focal point on one card, very clever, girl!!! Cute card with the flip flops! Love the pretty colors you used! Flip flops are so colorful. Great summer card! Fun flip-flop card, beautifully coloured! Your card is awesome and refreshing ! I love the flip flops! It must of took you forever to color so many! Great job! Beautiful repeat stamping and love the great design. So cute with these colorful flip flops. Fantastic card! Love the flip flop background with the popped up sentiment and flip flops! Such a fun flip flop card! Oh my ! These Flipflop are so cute and fun ! !